First of all, I hope you all had as good a Christmas as we've had. Not too much drink and food, but enough to enjoy. Last day of the year and the first day we’ve moved since a week last Thursday! Plans changed, and we decided to stay for another few days. Trinity had had a Christmas lights competition, these are a couple of the entrants. kids Megan and Luke, along with my parents. 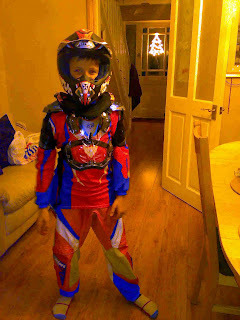 Luke in his new Motor Cross gear. His father was a keen motorcyclist, and the son is following in his footsteps. 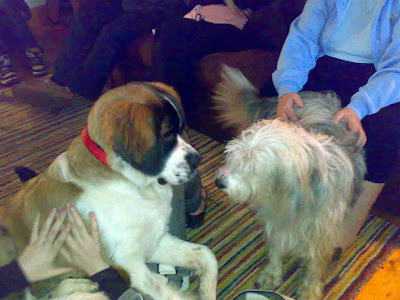 Finally, Kay and her fella Paul came across to see us yesterday, bringing Elvis and Ruby with them. It got a bit crowded when they were playing.. 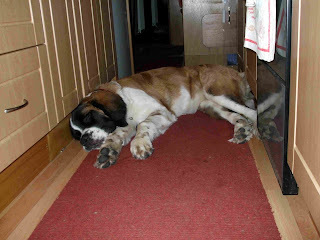 But it was a lot quieter when they went to sleep afterwards. We’ve had a really good few days, seeing the family again, including brother Pete who lives in Scotland and who we haven’t seen for quite some time. 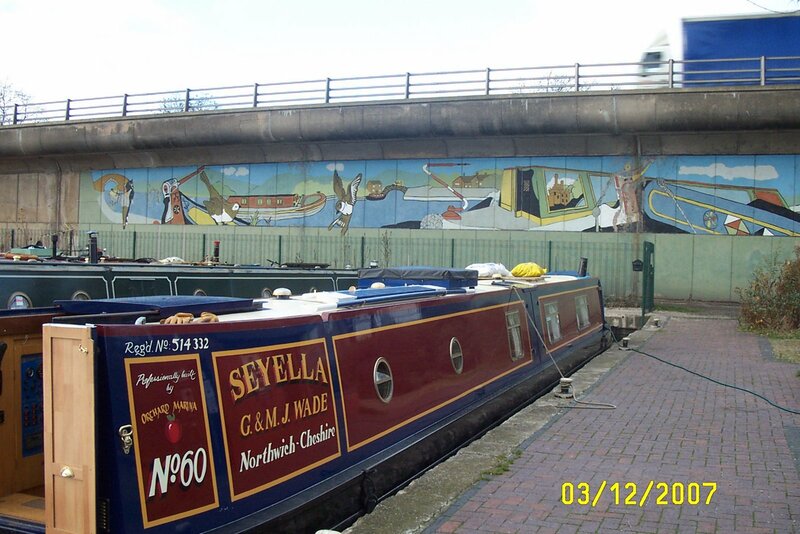 We’ve also made some friends in the marina who we’ll look out for on our travels. We left the marina today, after I took the car back to Enterprise. But we only cruised for about ½ a mile before stopping. We’ve got to ease back in gently, after all. We’re hoping to meet up with Carol on NB CORBIERRE in the next couple of days. 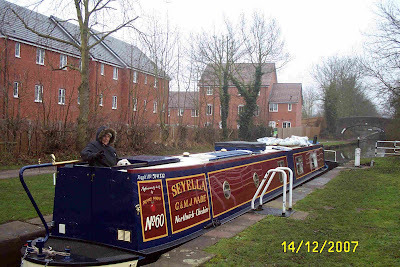 We travelled the Leicester line with her last winter, but we’ve not seen her since Market Harborough last January. I spoke too soon yesterday. “No frost for 2 nights now”. 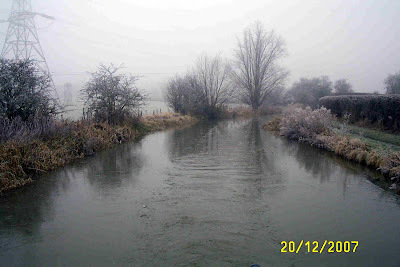 Woke up this morning to a frozen canal, frost on the trees and grass and a freezing mist hanging over everything. Waited till nearly 11:00, hoping someone else would be moving to break the ice, but we had to get going as we’d arranged to be at Trinity Marina by lunchtime. It was a cold 3 miles, taken slowly because of the ice. 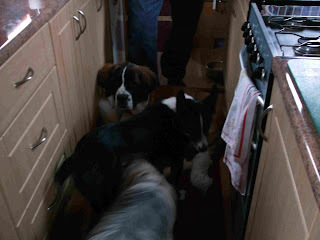 We arrived about 12:30, manoeuvred into our allocated berth, plugged in the mains cable and went inside to defrost. We’re stopping here for a week, leaving next Thursday. I’ve got a car organised from Enterprise here in Hinckley, and we’ll be visiting family over Leicester way over the festive season. Here’s one way to save diesel – PEDAL POWER! Just had a short cruise down to the junction yesterday, filled and emptied as required, turned around and came back to our mooring spot. The Greyhound at Hawkesbury Junction. Meg's enjoyed herself while we've been here. On the opposite side of the canal is what used to be a colliery spoil heap, then a golf course, now just a large landscaped area of grassland and bushes. The locals exercise their dogs here, so she was in her element. 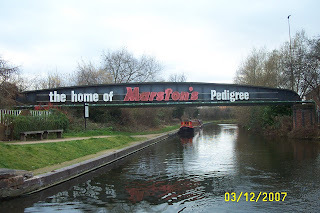 Today we set off at around 11:15, back up to Marston Junction and turned right onto the Ashby Canal. 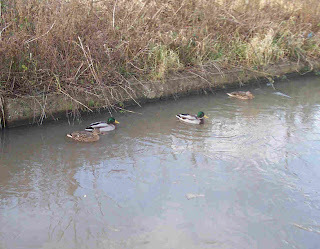 Onto the Ashby It’s slow going on this canal as it’s so shallow. If you try to go faster you just create a lot of wash and noise with no increase in speed. 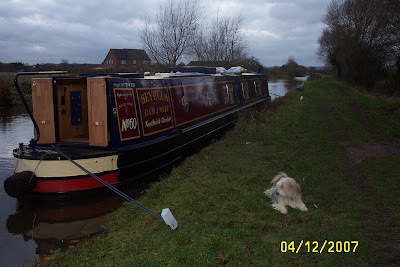 So plodding along at 2 mph for another hour took us to our mooring just south of Burton Hastings. 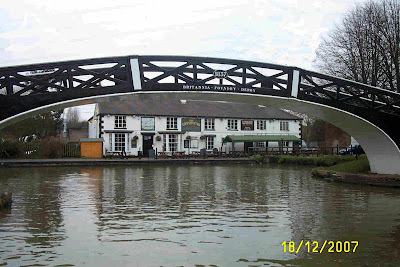 Near Burton Hastings Just 3 miles tomorrow will take us to Trinity Marina in Hinckley, where we’ve got a berth for a week. I’ve organised a hire car too, and we’ll be shuttling back and forth to see my family near Loughborough. It’s been another cold day today. No frost for 2 nights now, but the easterly wind feels like it’s coming from Siberia! Occasional glimpses of the sun raised the spirits but not the temperature. We’ve had a cold weekend, not much sun so the temperature has not got much above 4 or 5 degrees, with hard frosts overnight. No change for today either. The canal was iced over again, so we waited till 11:00, by which time a couple of boats had gone past, breaking up the surface. 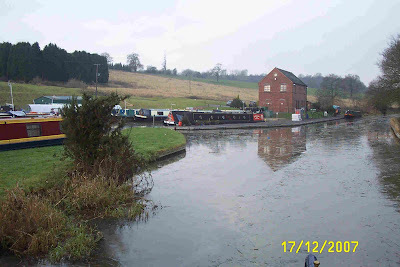 We headed off, towards Nuneaton and then to Hawkesbury. 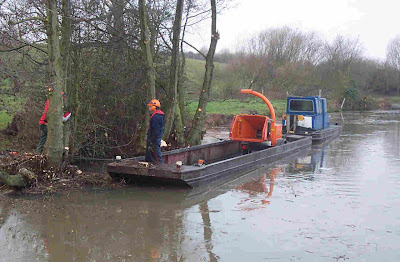 BW (or contractors) were busy cutting back trees and bushes on both sides of the channel. 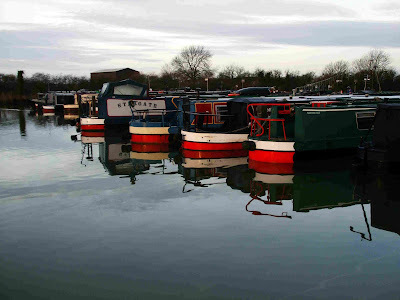 Springwood Haven is an attractively set marina and boatbuilder, just north of Nuneaton. 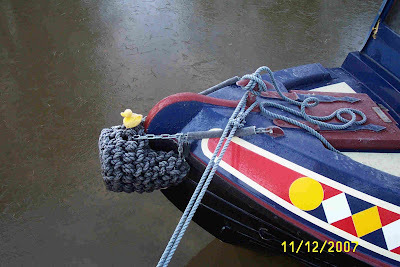 While we were chugging along, with the prop chopping the bigger lumps of ice into gin and tonic sized bits, I pondered how the ducks and swans manage to keep their bums warm whilst paddling about in water at around freezing point. They must have extremely good feathers underneath! We saw 2 or 3 other boats moving today, about right for the time of year. 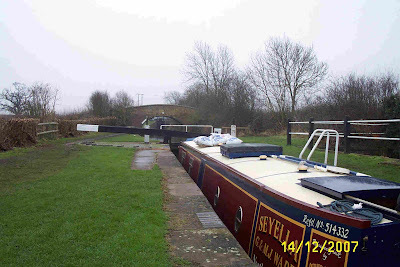 We stopped about ½ a mile before Hawkesbury Junction, I was glad to pull over as a very cold Northerly has sprung up since lunchtime. Spent a couple of days at Polesworth. Good shopping in the village, and some long walks with Meg. The weather remains good, frosty nights but fine and sunny days. 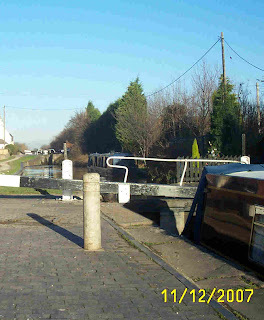 We moved down from Polesworth yesterday, just a short trip to near the water point at Bradley Green. Bright in the morning after overnight frost, turning overcast at lunchtime then brightening again later. 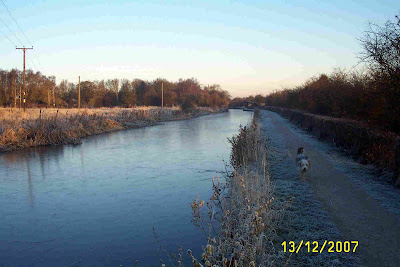 Another hard frost overnight last night, the 4th consecutive night we’ve had a frozen canal! 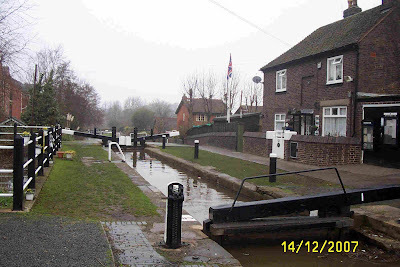 Got away at 11:00, 5 minutes to the water point, then into the bottom lock of the Atherstone flight by 11:40. Only one other boat in the flight, a plastic cruiser coming down met above lock 7. This meant the rest of the locks were in our favour, and we cleared the top lock at 5 minutes to 2. 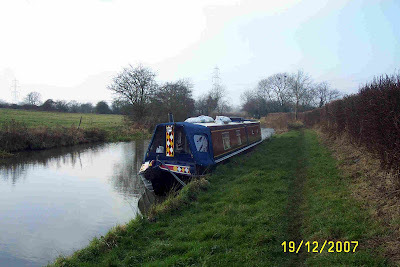 2 miles and 50 minutes later we were tying up near Hartshill just down from the BW maintenance yard. 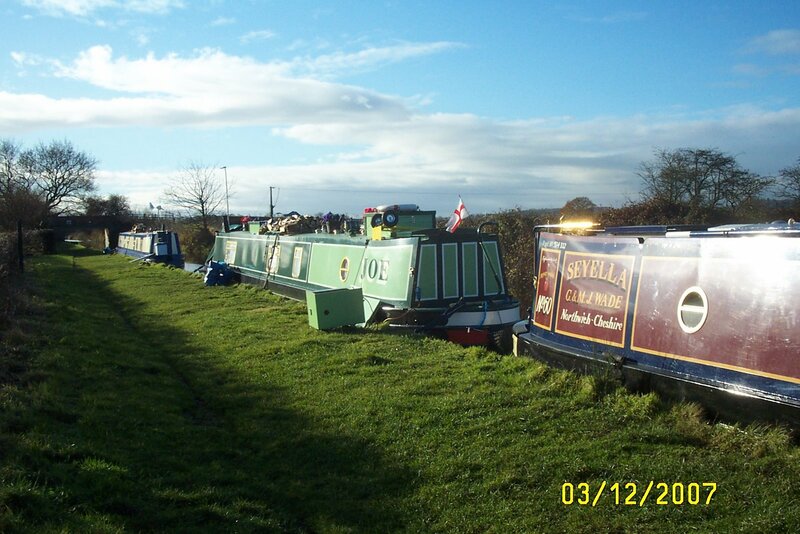 No room on the official moorings, so we’re on the grass towpath. It’s not too bad here, but further along it’s like a ploughed field, just mud and icy puddles. It’s felt very cold today, we’ve not had the benefit of the sunshine like we’ve had the last couple of days. Overcast and feeling damp. We had a hard frost overnight, but even so I was surprised to see the canal iced over outside the window! But with the clear skies, the frost and ice soon cleared, to make a beautiful day. It Doesn’t Get Much Better Than This – Blue Skies, Frost on the Cabin Top and a Smokey Chimney. Towards Fazeley I spotted today’s winner of the Seen Better Days Award. A wooded hulled cruiser, sitting on the bottom between 2 plastic boats. 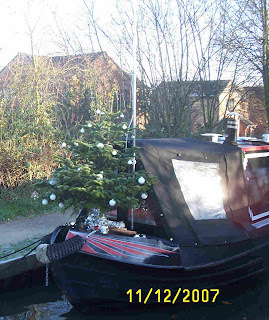 Someone’s ready for Christmas and Glascote Locks in Sunny Tamworth. We ended the day at Polesworth, after a long (by our standards) day of 5 hours. As I said before, a beautiful day, cold out of the sun but fairly warm in it. “Fairly warm” being of course a relative term, it is December! But now the wind has dropped and the rain has cleared off it still feels warmer. The forecast says this is set for most of the week. Great. 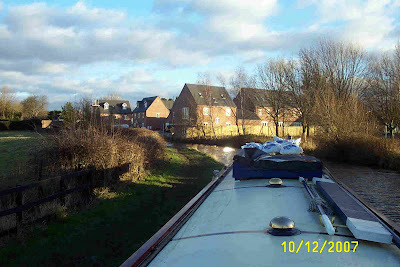 We hung around Fradley till today, waiting for the stoppage on the Coventry to re-open, and the weather to improve. 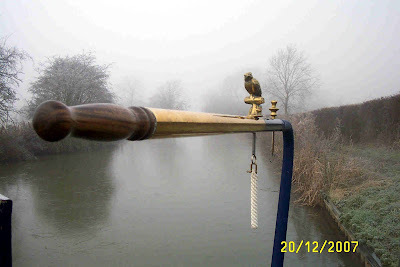 It’s been a little bit wild, very wet and windy, but we were fine, moored on the VM at the junction. Organised a delivery of Excel smokeless fuel from the local coalman as well, 10 bags for £66 was £14 cheaper than the local boatyard! Thanks Tony and Jacqui for the telephone number. 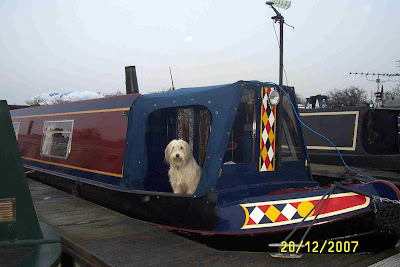 We needed diesel, so I made a few phone calls today, to boatyards in the vicinity. 63p/Lt here at Swan Line at Fradley, 67p at Fazely Mill, and a whopping 68.5p at Streethay Wharf! To put it in perspective, we last filled on the 6th November at Wheaton Aston on the Shroppie, and paid 49.8p/Lt. Needless to say, we filled at Fradley. 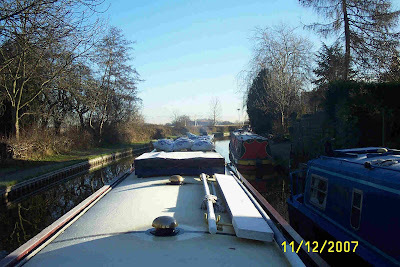 After emptying the loos, and filling water and fuel, it was past midday, and we had a gentle cruise down to Whittington, arriving soon after 14:00. Streethay Wharf, home of the 68.5p/Lt diesel. But look at the sky! 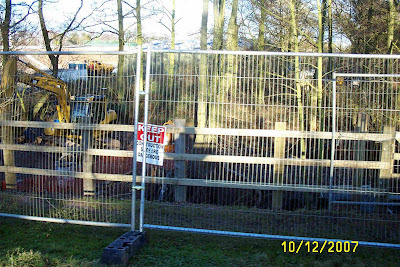 We came through Huddlesford Junction, where the canal had been closed till last weekend to enable repair work on a culvert. Looks like final tidying up is still in progress. 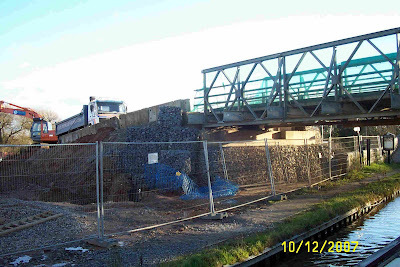 Still, Network Rail haven’t finished their bit yet, from when they widened the railway bridge. Moored just outside Whittington. Those houses weren’t there last time we were here! 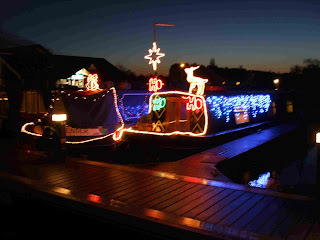 A bit of essential shopping tomorrow, and post some more Christmas cards, then down to Fazely and through Tamworth. Back towards Fradley today. A grey day but no rain, and the wind has eased a little more, too. 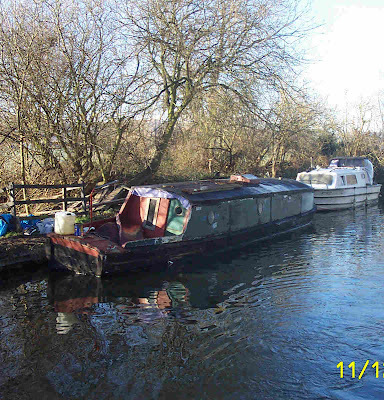 Only saw one other boat on the move today, a Canaltime hire out of Sawley, met at Wychnor Lock. The river section just East of Alrewas had “Proceed with Caution” at both ends now, and is about 8” higher than the end of last week. Still no problem though for us intrepid voyagers who’ve tackled the tidal Trent! This sign is next to a flooded gravel pit near Branston, now used by a local fishing club. 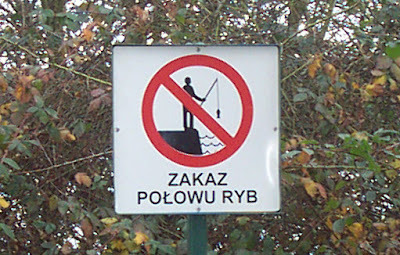 Apparently, there is a large Polish population in Burton on Trent, who treat fishing not as a sport, but as foraging for supper. 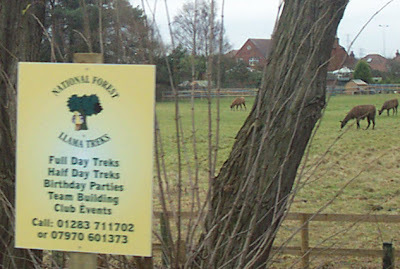 And if you fancy something different for the day, how about Llama Trekking! The tag line on the website is "You'll feel calmer with a llama". Superb! We stopped in Alrewas for bread and milk, and to post cards for those family and friends who live in the Colonies . (Canada and New Zealand). 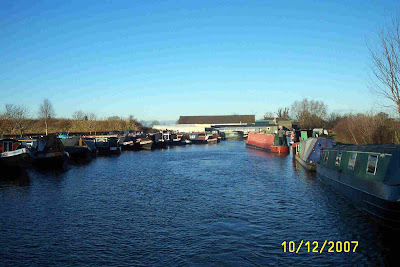 Then moved on for another 35 minutes and stopped at one of our regular spots between Bagnall and Common Locks. It was a bit bumpy over the weekend! High winds and heavy showers had us rocking a bit, but we were well secured and anything that could blow off was tied down. 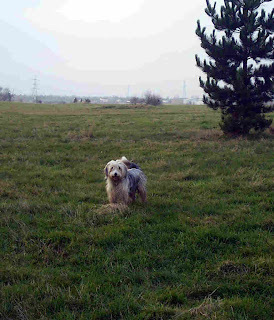 I managed walk Meg in the (mainly) dry spells, but was not so lucky on my Sunday morning run. 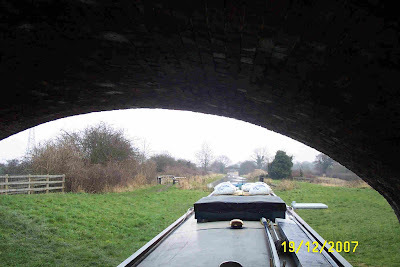 Today, with the weather improving, we decided to head into Burton on Trent, to Horninglow Basin and the water point and winding hole, and then back to Branston. Mooring near Branston, bright Monday morning after the wet and windy weekend. Burton still lives up to it’s reputation as the UK’s primary brewery town, but the 31 independent producers in it’s heyday have now been reduced to only a few. 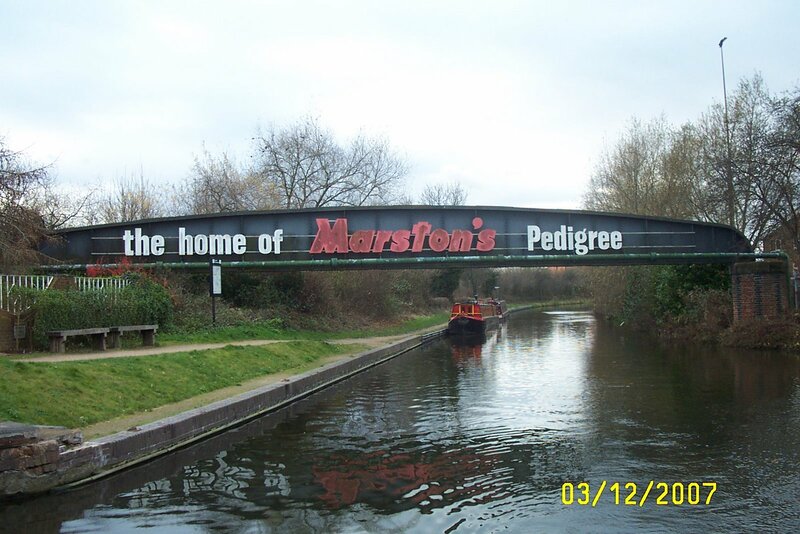 Marstons Brewery is near the canal. 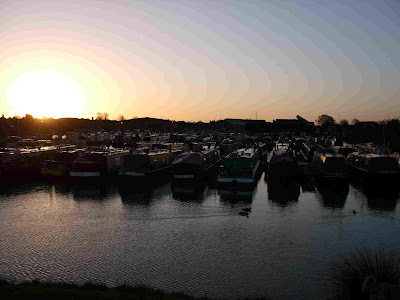 Horninglow Basin, once a major wharf, is now a shadow of it’s former self, being chopped off by the construction of the A38. Still, they used the resulting wall for an attractive mural. 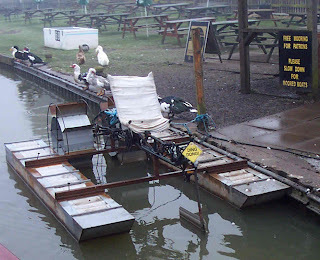 We had a bit of trouble turning around to come back to Branston, we had to reduce the overall length of the boat by lifting the fenders at each end! The weather started bright and sunny, but clouds started to build up around noon, and the rest of the day was sunny spells and odd showers. We just got moored up again when the heavens opened and the wind increased, I’m glad we’d stopped else we’d probably have been blown onto the bank anyway.